Designed and constructed by a multidisciplinary team of Rhode Island School of Design students, Southlight is a flexible performance space built from a greenhouse kit, creating an active public space for the neighborhood. The project is based on learning from one another through education, design excellence and community engagement. SouthLight is a new performance venue and public garden for the community and partners of the Southside Cultural Center of Rhode Island (SCCRI). 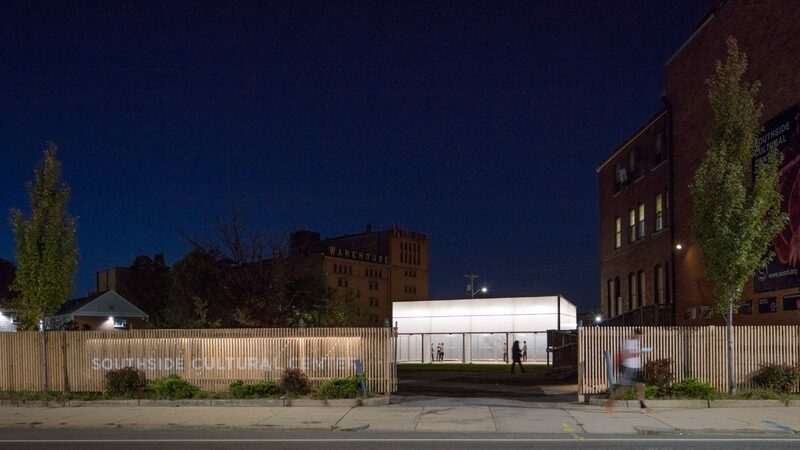 Providing a welcoming public space while creating a renewed civic presence for the center and its tenants, SouthLight is the culmination of a year-plus long project that drew together contributions from the RISD and Providence communities as well as renowned design-industry practitioners. Supported by grants from ArtPlace America and Rhode Island Housing, students and faculty worked with key community stakeholder groups through a collaborative process that brought progressive design thinking to a robust community engagement process in one of the most diverse neighborhoods in Providence. At the heart of the project was a commitment to learning from one another through education, design excellence and community engagement. The centerpiece of the design, which integrates architecture, urban design and landscape thinking, is a three-season performance pavilion that opens on all sides, while the new landscape expands the space and connects bordering streets, creating an active public space for the neighborhood to enjoy. 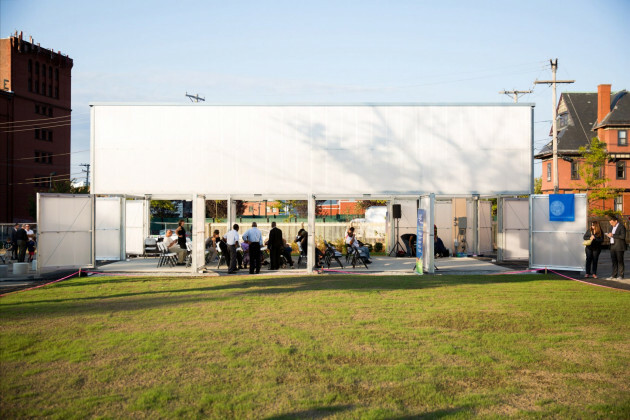 In addition to serving the needs of the resident performance groups, the project serves as a neighborhood resource by allowing SCCRI to expand its programming and better serve the needs of the community. 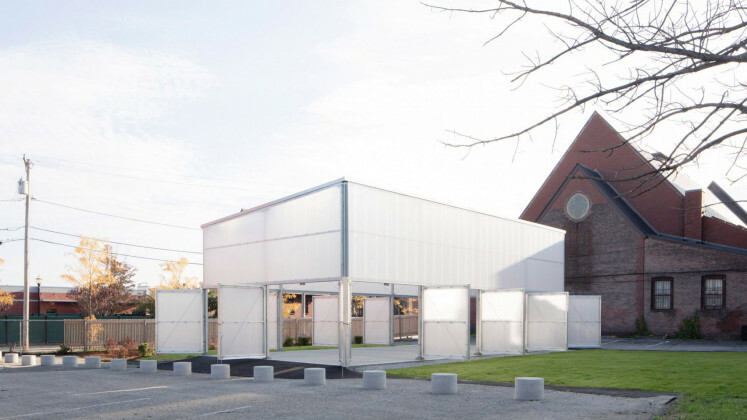 Led by RISD faculty Aaron Forrest, Yasmin Vobis, Elettra Bordonaro, and Katy Foley, students worked to construct the entire project over the course of eight weeks. The students also formed a fundraising team to solicit in-kind donations of materials and services, including concrete pavers, cedar fencing and lighting fixtures, from local and national suppliers. 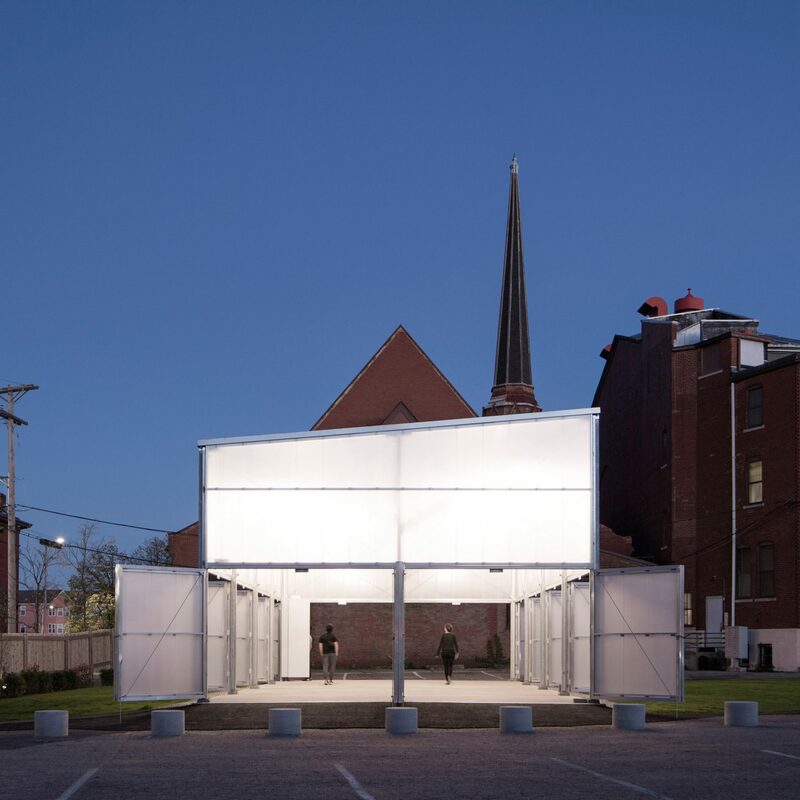 The SouthLight pavilion is a luminous, flexible space that opens in all directions using 24 monumental swing doors. 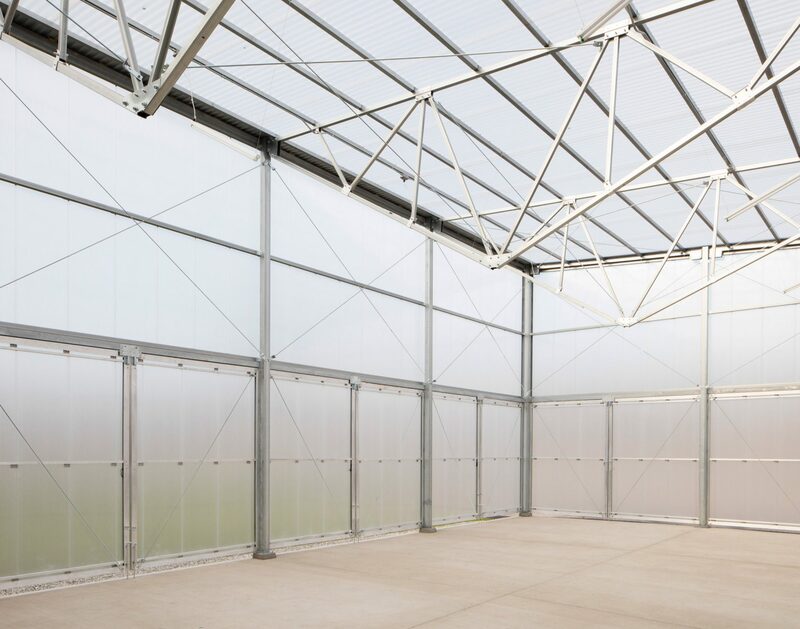 The 1,200 square-foot pavilion is constructed from a greenhouse kit, repurposed to transform an economical, pre-engineered shed into a building with civic presence. The gable truss of the greenhouse was inverted to reduce the pitch of the roof, and standard galvanized steel profiles were combined with a tongue-and-groove translucent polycarbonate cladding to naturally illuminate the interior during the day and to illuminate its surroundings at night through the continuous glow of the interior lighting. 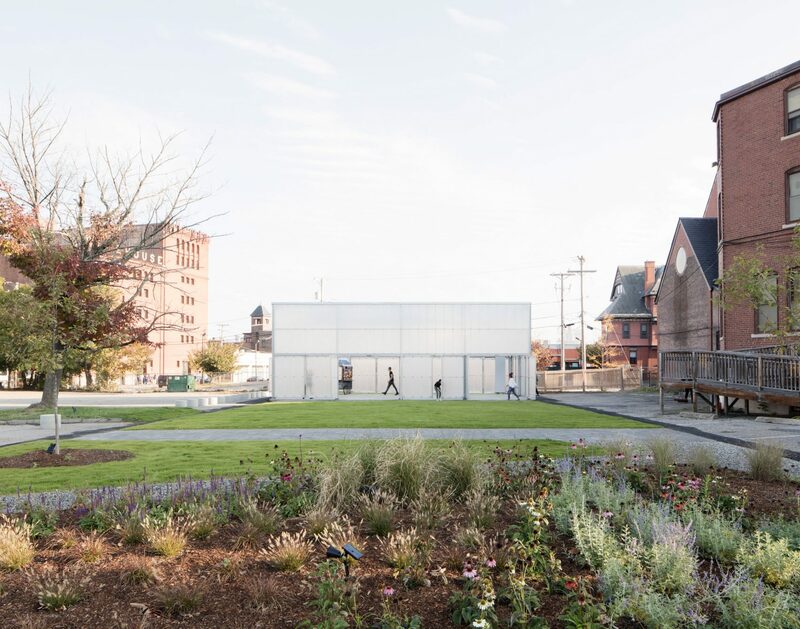 The 10,000-square-foot garden serves simultaneously as public space, event venue, storm water mitigation and educational tool. 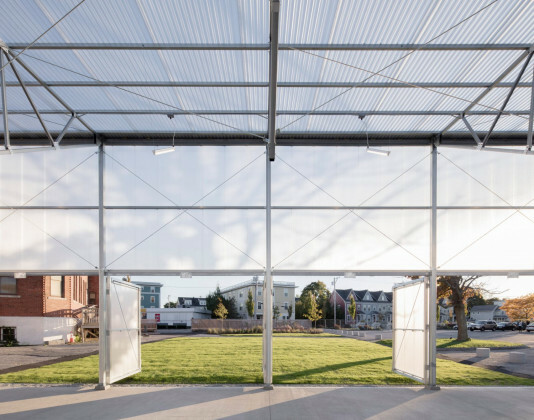 A generous lawn stretches out on both sides of the pavilion, creating spillover space for large events and a pleasant environment for public use when the pavilion is closed. The rain garden at the north end collects runoff from the parking lot and serves as an attractive backdrop to the pavilion itself. The gardens feature drought-tolerant, native plantings that provide a low-maintenance but lush entrance from the adjacent public way. 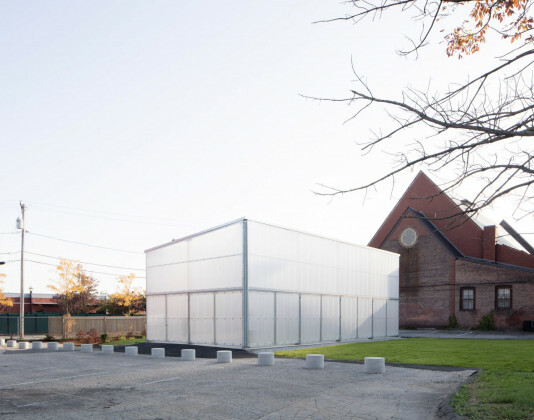 Paved and gravel paths cut across the space, creating multiple trajectories through the garden.